Sónar São Paulo recently announced the dates of its 2013 edition, now an established event in the calendar of major events in the city of Sao Paulo and Latin America. 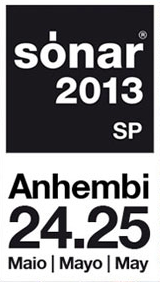 After previously deploying an unprecedented and unique setting in Anhembi, the event will be held there again on 24th and May 25th, 2013 - Friday and Saturday. With great critical acclaim and a huge audience, last time Sonar São Paulo gathered more than 30,000 people during the two-day festival. There were 48 music performances offering more than 56 hours of music on three different stages. Lovers of music, art and technology enjoyed the unique 3D show by Kraftwerk, the live-shows of Justice, Mogwai, Flying Lotus, Criolo, Chromeo, Modeselektor and James Blake, among others. Also, pop star Cee Lo Green, Little Dragon, TEED, Squarepusher, DOOM, Emicida and DJ sets by Rustie, Seth Troxler, Four Tet, Gui Boratto and the historic meeting of Marky and Patife, as well as the special concert by Alva Noto and Ryuichi Sakamoto, quoting only a few highlights that made the line-up one of the most praised of the year. Sónar São Paulo is an initiative of Advanced Music and Dream Factory.